Pot pie is my favorite, favorite, favorite comfort food ever. And let’s be honest – those freezer versions will do in a pinch but nothing hits the spot like one you made yourself. 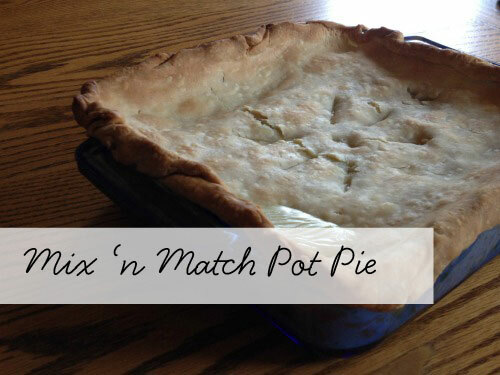 I love this recipe, because depending on what leftover meat you have around you can build a pot pie to fit your needs. 1. In a large saucepan, cook onion, celery, and sweet pepper in hot butter over medium heat for 4 to 5 minutes or until vegetables are tender. Stir in the flour, thyme, salt, and black pepper. Add chicken broth and milk all at once. Cook and stir until thickened and bubbly. Stir in cooked chicken, frozen peas and, if you like, parsley. 2. Pour mixture into a deep-dish (such as a 11x7x2-inch baking dish [2-quart rectangular], an 8x8x2-inch baking dish [2-quart square], a 2-quart souffle dish or casserole) or six single-serving dishes (such as six 10- to 14-ounce au gratin dishes, individual ramekins, casserole dishes or 5-3/4-inch disposable foil pot pie pans). 3. Immediately place crust over filling – cutting slits to release steam. 4. Bake, uncovered, in a 400 degree F. oven for 30 to 35 minutes for deep-dish (20 to 25 minutes for single-serving dishes) or until crust is golden brown. Let stand 20 minutes for deep-dish (10 minutes for single-serving dishes) before serving. Makes 6 servings. Hint: I can’t make a pie crust to save my life but I can buy one with the best of them. I’m also not afraid to use fresh carrots or peas if that’s what I have on hand. Make it with what you have on hand, that’s the benefit of this meal. Cooking multiple meals at once is a great way to prepare for busy nights and this meal is super easy to double. Make one right away and let the other cool in the fridge then wrap tightly and place in the freezer. Take it out to thaw the day before and you’ve a go to meal. You can find lots of other great freezer meals here or just do a pinterest or google search.